Adam McNicoll originally penned a deal with the Dynamos in the summer of 2013 and arrived in Gillingham having risen through the junior ranks in Dundee before a year across the pond in the Greater Metro Junior A hockey League (GMHL). The blue liner had been a part of the Dundee Junior Stars team that swept their way to league and cup success and also featured for the senior Comets in the Scottish National League who claimed an emphatic treble by finishing top of the pile in the SNL, securing the silverware in the league cup and taking top honours against North Ayrshire in the playoffs. 2012/13 then saw him venture across the Atlantic where Ontario Canada became his home as he trained with and iced for the Orangeville Americans. McNicoll would don the Orangeville jersey 31 times during the regular season and on a further 6 occasions come the playoffs – the skater claiming 9 goals and 7 assists from deep to help his club finish ninth in a league of fifteen. In 2013/14 the young defenceman’s services were then acquired by the Invicta Dynamos but, despite a hugely promising start to his career in Kent, the skater departed the club and returned north after just 12 appearances having struggled to find work in the south east. He continued to play hockey however – 11 goals in as many games coming in outings for the Dundee Comets in the SNL back home whilst he notched 12 points from just 4 fixtures when appearing for the under 20s. He will ply his trade in the NIHL South’s top tier from now on though after re-signing for the Dynamos for the duration of 2014/15 and will be looking to pick up where he left of ahead of his move in the previous campaign. “Adam arrived from Scotland as a bit of an unknown quantity for a lot of people last summer but he soon impressed with a string of good performances once the season got underway. He showed great promise from the off and so it came as a blow when he had to return home after just 12 appearances at the Silver Blades. However I did say to him when he left that the door would always be open should he want a return and so I’m very happy that he has taken up that option ahead of 2014/15. Adam is only just approaching 20 but he showed great composure when icing for us on the blue line last year whilst he has an equally good record playing as a forward. 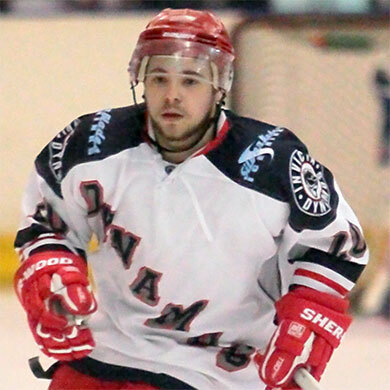 He’s a skater who provides us with options and he returns to Kent with unfinished business in the NIHL. I look forward to working with him again during the upcoming campaign and believe he will grow to be a key player in this side”.